Truevision TGA is a raster graphics file format. It was developed by Truevision Inc. in 1984. It was further modified in 1989 when thumbnails, an alpha channel, gamma value, and textual metadata were introduced. TGA files commonly have the extension ".tga" on PC DOS/Windows systems, and ".tpic" on Macintosh systems. The format stores image data with 1–32 bits of precision per pixel. Color data can be color-mapped, or in directcolor or truecolor format; optionally, a lossless RLE compression can be employed. TGA files are not supported by many image viewers. So many people choose to convert them to TIFF, JPEG, or PNG. 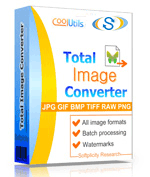 A most powerful Total Image Converter will help you perform the task. Select the files and press Convert button. The original files are never corrupted. Get your free copy now.